The pictures of the 20 lei 1868 coin above are present on Romanian coins through the kind permission of Ponterio & Associates, Inc., Bowers and Merena Auctions. 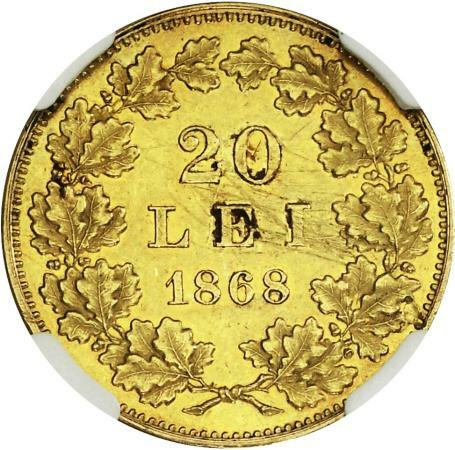 The golden 20 lei coin of 1868 was struck in a very small number of pieces, one or two hundred (the sources contradicting each other), fact that renders it one of the greatest world numismatic rarities. Despite all these its value is estimated at as little as something between 5.000 $ and 10.000 $. Prince Carol I gave these coins as gifts to the Europe's crowned heads shortly subsequently to becoming the ruler of Romania, and also to his relatives and Romanian political chiefs. Of course, it is pointless to say that the coin did not circulate at all. Because it was never released for circulation, 20 lei 1868 coin is considered by many to be a pattern (Iliescu and Radovici in Monetele României - Coins of Romania, 2004, Schäffer - Stambuliu in Romania - designs, pattern coins and catalogue of issued coin, 2009). The pieces were struck - most probably - at State Mint in Bucharest. Other hypotheses assert that these pieces were struck at Paris or at Berlin. It is a famous coin, the first golden one struck by the modern Romanian state. A hard to believe yet dear to the Romanian numismatics legend states that some of these coins were buried in the time capsule at the foundation of the Peleş castle at Sinaia. The coin was struck in 1868, and the castle built five years later in 1873, having been meant to resemble the Sigmaringen castle (the Romanian royal dinasty belonged to the Sigmaringen strain of the Hohenzollern family). 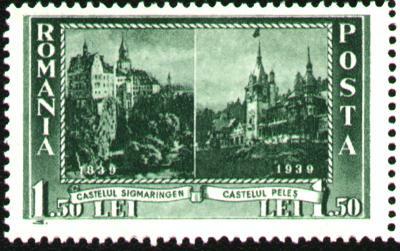 You can see inside the picture at right castle Peleş from Sinaia (implied in the 20 lei coins' legend) and castle Sigmaringen as well, at left (Romanian stamp from 1939). In 2005 the National Bank of Romania issued a golden replica of the 20 lei 1868 coin. The replica and the original coin are almost similar, the only difference between them being the letter R under the effigy, letter that warns about its (replica). The 2005 coins are BU, i.e. brilliant uncirculated. The term BU means an uncirculated coin with the mint luster intact. In order to obtain a BU coin the dies are carefully polished. The blanks are also polished, in this way the coins having a luster far superior to the luster of the common uncirculated coins. The replica of 20 lei 1868 gold coin belongs to the History of coin series. To the same series belong two other replicas, one of gold koson and one of a coin-medal issued by Constantin Brâncoveanu in 1713. The pictures of the gold replica of the 20 lei 1868 coin and of the aluminum essay above are present on Romanian coins through the kind permission of Mr. Florin L.. The inscription on the coin shows Carol I as prince of the Romanians, title chosen as to show that the Romanian state included only a share of the Romanians within its borders and its natural pretention to become a state of the entire nation. Because many millions of Romanians lived outside the country's borders in Transylvania, Banat and Bucovina this title bothered the government of Austria-Hungary, that saw there claims over their possessions inhabited by the Romanians (many Romanians lived also in the bigger part of Basarabia, still held by the Russian Empire after the Crimean War of 1856). 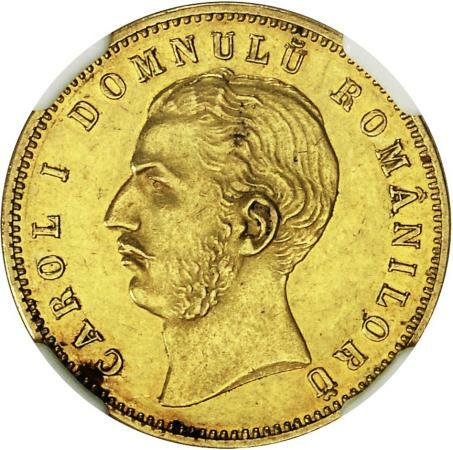 On the following coins issued by Romania (1 silver leu and 20 gold lei from 1870) Carol I became DOMNUL ROMANIEI (PRINCE OF ROMANIA), being represented with the effigy on the coins. The presence of the effigy was deemed by Turkey as a sign of Romania's independence tendencies and, as consequence of Turkish protests, the effigy on the silver coins issued between 1872 and 1876 was replaced by the coat of arms or the crown of Romania. 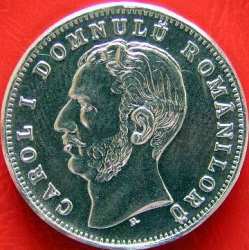 The title REGELE ROMANILOR - KING OF ROMANIANS - was retaken by Romanian king only after the Great Union of 1918, that rejoined Basarabia, Bucovina, Transylvania and Banat with the old kingdom, the title lasting on the coins until Romania became republic (1947) as result of Soviet occupation. The inscription on this coin uses the short final u (mark by a diacritical sign) at the end of words DOMNUL and ROMANILOR. In an early stage of the Romanian language evolution all words ending in a consonant had also a sounded u at the very end. With time this final u dissapeared from pronounciation. At the times this coin was struck the ortography pretended to be etimological, and the Academy had not succeded in imposing a unitary writing. Short final U appears on this piece and on 1 ban 1867 in written as BANU . Short final U was eliminated almost totally by brochure "Regule ortografice" printed by the Romanian Academy in 1904, edited again in 1907 as "Ortografia Academiei Române declarată oficială şi obligatorie a se întrebuinţa de toate autorităţile Statului" meaning "Romanian Academy Ortografy Declared Official and Compulsury to Be Used by All State Authorities", in 1919, 1924 and 1932. The singular of the nouns ending in i kept a while the short final u that today is completely disappeared. The reform in 1903 banned the strange letters î of e, of u and of o - ê, û, ô.